The Nissan NV2500 Concept is, as its dimensions suggest, a multi-tasker of large order. One of the largest concept vehicles Nissan has ever produced, the NV2500 Concept, offers fresh design and fresh thinking â€“ including a 3-Zone interior and flexible utility and storage solutions. Not only does the NV2500 Concept provide an original take on Commercial Vehicle (CV) design, it also provides a preview of Nissanâ€™s entry into the CV market in North America. With Nissan CVs already sold in 73 percent of the worldâ€™s markets, including Japan, China, Mexico, Europe, South America, Australia and the Middle East among others, Nissan will enter the CV business in North America in 2010. The line will incorporate three all-new products in three years, as well as products from the global stable. As a result, in the mid-term, Nissan will offer a multi-segment CV lineup up to class 5 gross vehicle weight ratings (GVWR). The three new products are being developed by Nissan specifically for the North American market and will be built at Nissanâ€™s manufacturing facility in Canton, Miss. Nissan is investing $118 million to expand Cantonâ€™s production to manufacture CVs. In this configuration, the Nissan NV2500 Concept is designed for construction use. It bears the logo of Habitat for HumanityÃ’ only to illustrate the partnership between Nissan and Habitat. Over the past three years, Nissan has donated $3 million in cash, vehicles and house sponsorships, along with thousands of hours of work volunteered by Nissan employees. The NV2500 Conceptâ€™s â€œwall-lessâ€ mobile office/workspace design includes a computer workstation, fold-down conference table, numerous storage compartments, cargo/tool tie-down racks, nearly six feet of interior height and an awning-style side panel that opens to create a standing outside workshop table. â€œAside from construction site applications, the NV2500 Concept, with its unique configuration and array of features, could be used in infinite ways by infinite users. Whether a mobile Farmersâ€™ Market booth, a hot-air balloon launch or chase vehicle or to support a beachside surfing school, the usage possibilities of Commercial Vehicles are endless,â€ he said. 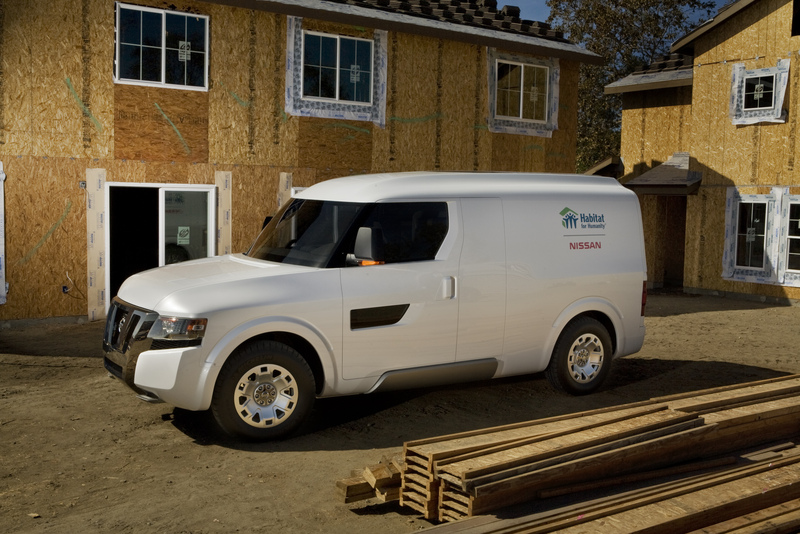 The NV2500 is conceived first and foremost as a powerful, multi-purpose utility vehicle. Built on a modified Nissan Titan full-size pickup all-steel, fully boxed ladder frame, engine choices would be selected for competitive power and fuel efficiency. Other under-skin components include an automatic transmission and solid rear axle. The wheels are a special 20-inch billet aluminum design, while the Michelin tires include a special tread pattern designed for a good payload capacity and fuel efficiency. Dimensionally, the NV2500 Concept has a 147.6-inch (12.3-foot)) wheelbase and measures a full 19.5 feet bumper-to-bumper. It stands 8 feet tall and is 6.6 feet wide. Inside, from the front of the passenger compartment to rear door, there is room to carry objects up to 10.5 feet long with the passenger seat moved out of the way. The NV2500â€™s exterior design is highlighted by a wide grille, pronounced wheel arches, stepped roofline, well-defined fenders and unique window and roof treatments. Along with wraparound-style windshield/front door windows, the NV2500 Concept features lower door-glass cutouts and an oversized, fixed-glass roof panel that stretches from behind the B-pillars to the rear doors â€“ adding a visual lightness to the design and illumination to the interior. The NV2500 Conceptâ€™s roof panel includes integrated solar panel technology to power interior equipment, lights and accessories. Additional exterior features include large, retractable outside mirrors, motorized flip-down AMP Research side and rear door steps, LED headlights and taillights, and dual-purpose tow hooks located in the grille that also serve as steps for easier access to the engine compartment. The most intriguing aspect of the exterior, however, is the multi-use doors. On the driverâ€™s side, the Titan King Cab-style Wide Open Door offers unfettered access to the front of the vehicle, with integrated storage compartments for carrying items such as tool/safety vests, ear protection and first aid kit. In the rear of the NV2500 Concept are vertical 60/40 split cargo access â€œbarnâ€ doors with additional storage compartments and power rear step for walk-through capability and easy access. The passenger side features a combination of a 90-degree opening vertical door directly behind the front passenger door and an awning-style clamshell panel that hinges upward and locks in place, creating a protected, standing workshop table on the outside and an open â€œpicture windowâ€ view from the fold-down interior work desk. The passenger side door also has integrated workshop tool storage with fitted compartments for power saws, drills, screwdrivers and drafting equipment. Inside the commanding NV2500 exterior is a 3-Zone interior that combines simple, organic solutions with elements of advanced technology. The NV2500 Conceptâ€™s front Driver/Passenger Zone is anchored by a wide instrument panel with a customizable navigation/audio/climate display. The instrument panel also has an accessory power outlet and a built-in retractable power cord. Overhead is a full ceiling storage console with visor shelves, center shelves and a cooling fan that can be powered by the roof-mounted solar cells. Located behind the driverâ€™s seat is a customizable, lighted storage closet designed to hold hardhats, flashlights and work boots â€“ complete with a mudroom-style grated floor for drainage. Additional storage is provided in the center consoleâ€™s locking compartment and the instrument panelâ€™s floating shelf. The wide, front-passenger seat can swing rearward on a sliding arm, manually moving and locking into position in front of the workstation console located behind the driverâ€™s seat or pivoting toward the work table. The workstation includes an oversized computer monitor and computer with laser-projected â€œeasy cleanâ€ keyboard. As fitting of a true work truck, the centerpiece of the NV2500 Concept is the third zone, the Conference Center/Cargo Bay Zone. Dressed in its construction office configuration, this zone includes a fold-down inside/outside workshop table. With the awning-style side panel in the open position, the table can also flip 180 degree to become a standing-height work surface. Lights on the awning illuminate the table. Mounted in the ceiling above the side panel is a built-in laser blueprint printer. The wall also includes 110/220W power outlets and areas for the built-in shop vacuumâ€™s air hoses. The opposite wall is dominated by sustainable wood slats for tying down or securing cargo. The engineered sustainable wood flooring includes a custom version of the Titanâ€™s popular Utili-trackÃ” cargo tie-down/sliding cleat system. The Utili-track channels run from rear door to front bulkhead on the passenger side of the vehicle. There also are multi-position integrated tie-down hooks and functional task lighting throughout the cargo area. Welcome to Car Design TV and please excuse the construction mess!